With Alpha Internet, you not only get a dedicated server, you get a completed managed hosting solution built on Windows Server. We will provide you with the tools, resources and support you need to run your business on the web. Windows Server, expands existing technology and adding new features to enable IT professionals to increase the reliability and flexibility of their server infrastructures. New virtualization tools, Web resources, management enhancements, and exciting Windows 7 integration help save time, reduce costs, and provide a platform for a dynamic and efficiently managed data center. Powerful tools such as Internet Information Services (IIS) version 7.5, updated Server Manager and Hyper-V platforms and Windows PowerShell version 2.0 combine to give customers greater control, increased efficiency and the ability to react to front-line business needs faster than ever before. Every dedicated Windows server is fully secured, configured, and customized for your specific business needs. 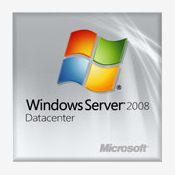 "Windows Server enables organizations to increase the reliability and flexibility of their server infrastructure."